No more lazy mornings. I got up early so that I could get there before it rains and be able to hike more. The drive there was not very long, only about 25 minutes or so. In the middle of the drive we arrived at Jackson Hole, the place that we would be going tomorrow to stay the day. There were a lot of amazing sights, as usual while driving, but is time it was a very scenic view from the mountains. When we got to rangers station they asked for our park pass, and we gave it to them. They thanked us and we drove to the actual park. On the side of the road there were rivers that we went over and some of them were almost flooding…. not a very good sign. We drove further down the river until we got to our destination. We saw a sight that you could have sold for millions. The Tetons were reflecting down on the river below near us, showing a beautifully clear image of two mountainsides. After more driving we were finally there! We went inside the visitor center, and it was magnificent. There were large glass windows showing the scenic view complete with bathrooms, a gift shop, a guide center, and a hipuge dining- room style of a map in the middle of it (and even better yet, it also happend to be 3D)! We walked around the building on the concrete so we could see the odd art that was presented on the side of the building. There were recycled bottles and cans turned into “water” that the “fish” were swimming in! We later got back in the car when we were done looking around, and drove to the Tetons itself. On the way there, however, it started to rain. And rain. And rain until we couldn’t go any further. I was entertained with my soduko, so I was perfectly fine when we pulled over to stop getting hit by the intense rain. Our car was still being hit somewhat hard by the rain, but at least we weren’t driving now. For an hour we just waited and ate lunch and I did my Soduko. 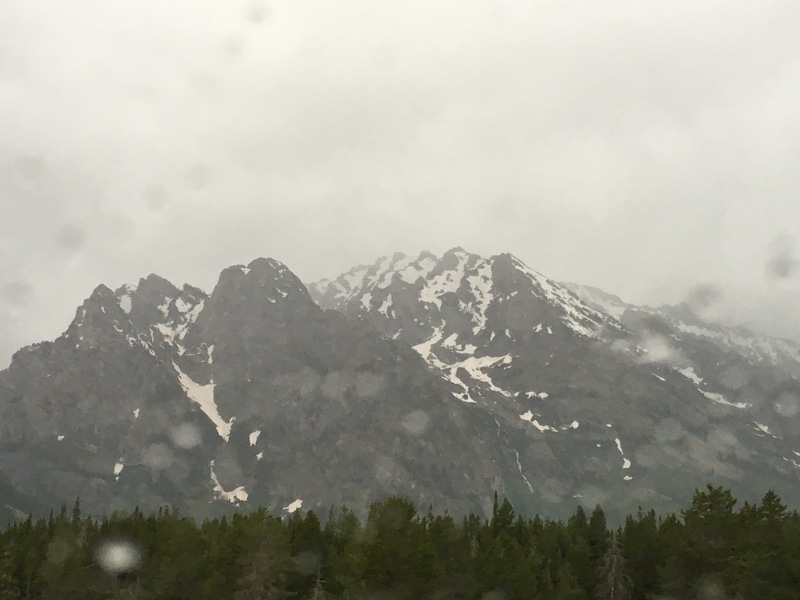 It was actually pretty fun, despite the fact that we didn’t actually get to hike the grand Tetons after all, but hey, we were in Wyoming now! After a week in Idaho we had finally moved to the Next state! We drove back to the local cabin while it was still drizzling and drank hot coco while we set near a warm fire outside. By that time we went home, and there were no complications on the way back. I started this new show called LOST and it was very entertaining. We wanted more, but we were also tired so we went to bed instead. What an interesting day! WELCOME TO WYOMING!👍😛 Hope u guys are having a wonderful trip!! I miss you guys!! I miss you too benson. And you for viewing my blog every day, your awesome! such a great experience. Thank you for sharing so we could be along with you. Whets our dreams to see it in person. I would seriously love that. Maybe we could schedule where we will be at the time of our trips collide? It’ll be great seeing this happen. I hope I go there one day to hike those trail. Glad you go to experience that though! The wonders of nature are far better to behold than any so-called ‘entertainment’ television could ever offer. I would love to see a moose with a baby. Last week when I was traveling to a campsite I saw a doe with two fawns. They were in the road. I stopped but they were gone from sight before I could get a picture. Maybe I should get a dash cam for those types of opportunities. Great Blog. I am getting to experience some new adventures through your stories. Thanks. Thanks for sharing your awesome opportunity! Sounds like fun! Thanks! The guide there said they only saw 2 that year. I have one question for you. I read your name and saw that you are a travel blog (correct?) would you like to be nominated for my travelers award? I am trying to nominate all of the travelers blogs I can and see how many others there are! Thank you so much Logan. Absolutely! It might take a little while for me to answer the questions, but thank you so much! Great! would you like the link? I always love meeting another travel blog!